One of the more rare purebreds and chocolate being one of the rarest colors they are relatively new to AKC the Havanese are the perfect companion pup always full of love! They are highly trainable and intelligent and possesses a naturally affectionate temperament, which makes the breed the ideal family pet. When the Havanese are raised correctly from birth they absolutely love children, pets and other people. Although a toy dog, they are energetic and require some daily exercise. The breeds non-shedding hair coat makes it suitable for allergy sufferers, but regular grooming is necessary to keep the coat in top condition. 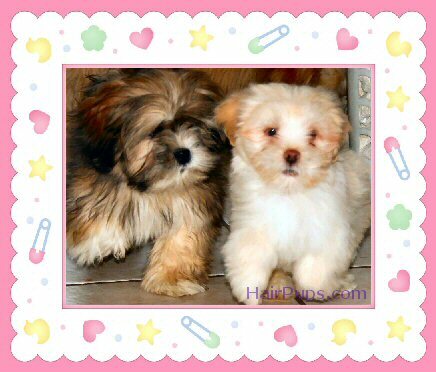 Standard Size: The Havanese height ranges from 8.5 to 11.5 inches and their weight can range between 7-18 pounds I have seen larger than 18 pounds but, our pups usually run between 8-14 pounds full grown depending on the mama and papa and coat length. All of our mom's and dad's are AKC registered most have champion lines. 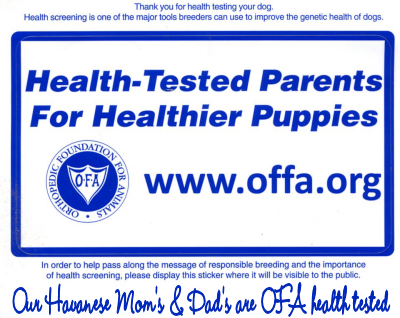 We dna and OFA health test each of our havanese mom's and dad's (& they have all passed as normal) to ensure health and genealogy. Most of our specialty testing services are provided to us by Cornell University. These tests include but, are not limited to serum bile acid levels, Baer on or after 6 weeks old, Cerf done yearly, Patella & Cardiac done on or just after 1 year old. Dna testing is done through American Kennel Club. We do this to ensure the long term health of each and every baby that is delivered into our hands. Your puppy only gets one start at this life so, why not make it the best? We retain the right to refuse any sale at anytime for any reason. Contact us with any questions you might have. We hope you enjoy our site and your visit! Copyright 1999-2017 HairPups - All Rights Reserved. Images/graphics from this website may NOT be copied/redistributed..